I've just fell in love with La Paire sandals, they've just got everything I like in a pair of summer shoes. They are colourful, they are comfortable, I've checked the inside and they are padded, and the quality is supreme. The price is not bad either at £ 109.00 so I can summarise saying that La Paire sandals will be a staple in any woman's wardrobe. These are the Viola sandals with an ankle strap and a scalloping motif. The inspiration comes from the decorations from Moroccan tiles. The blue and the white in contrast is just an example of how the designer reworked a traditional pattern for something new. This is the Viola sandal in white with a decoration of little flowers in red and white and blue piping. As well as North African ceramics, they remind me of the "Murrine" the typical decoration made with Murano glass. This other beauty is the Lily sandal. The strap make the ankles look thinner, I like the snakeskin print and the gold straps in contrast. There is just a hint of a heel, making them perfect with dresses or trousers or shorts and mini skirts. 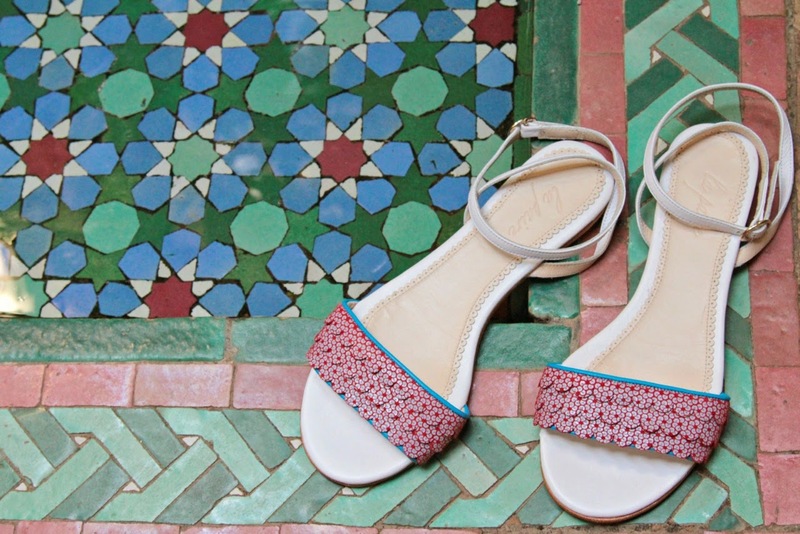 These are the Rose sandals in three colours, bright turquoise, white or black. All of them have got gold details and the style here is a bit Greek. All these sandals are priced at £ 109.00 and they are available at the moment only at www.lapaire.co.uk With these shoes your holiday suitcase is sorted, they are flat, they don't take much space and at the airport you don't have to take them off at the security control, because they can't hide anything.